After our drinks and snacks at Slowly Shirley, we wandered around a bit before landing at Horchata. Only a handful of people were inside at the bar, and some more at the tables in the back, so we snagged seats at the bar. I know I’m a super huge dork, but I love fun puns. 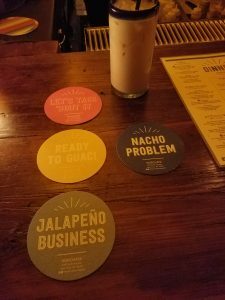 The coasters all had silly puns on them, and I had fun taking pics of them while the boys chattered. The above is in a traffic light pattern – red, yellow, green! Hard to see in the dimly lit pic, but trust me that’s the colors they are haha. 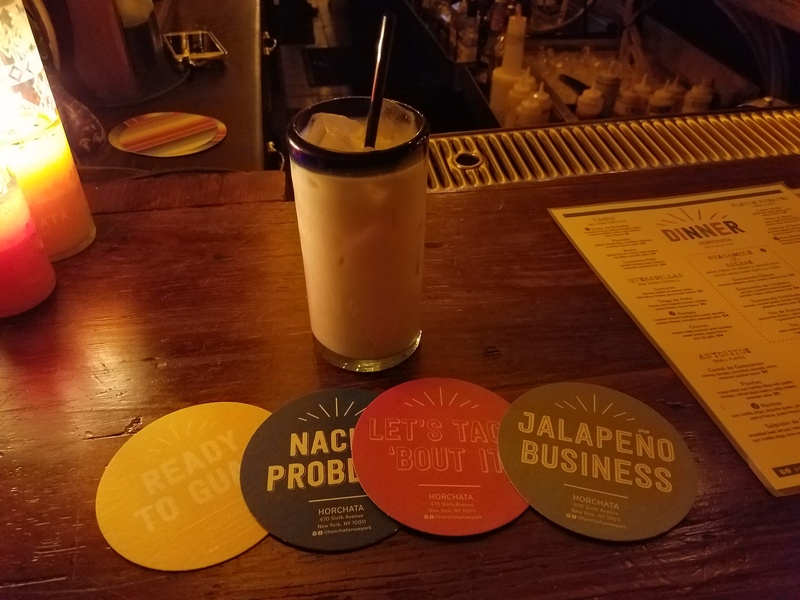 As for my drink — well, I LOVE horchata, and was happy to see they had horchata on the menu in multitudes – original/plain, one mixed with espresso, and the rest alcoholic. I’ll be back to try alcoholic versions one day (Rumchata has a permanent place in our home bar; I add it to my coffee or hot chocolate depending on the time of day back when I wasn’t pregnant)!! 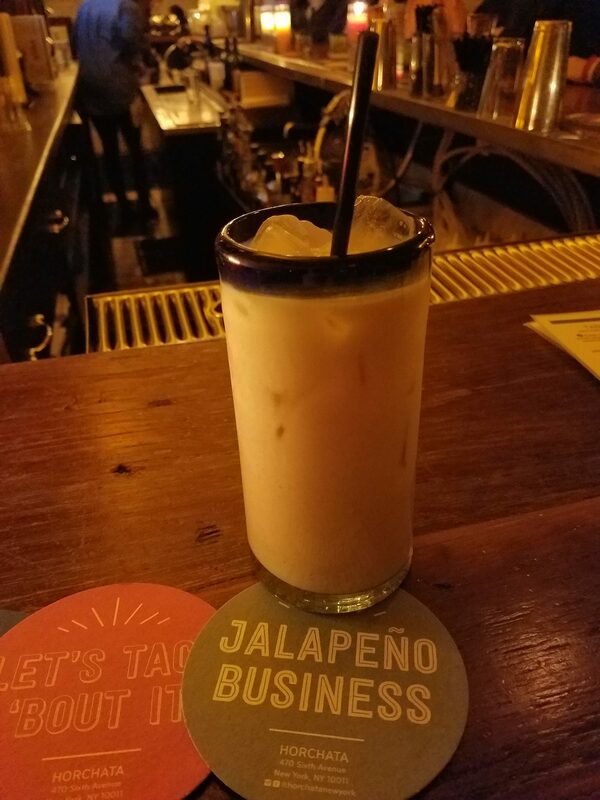 This one was… a little underwhelming while being a little overwhelmingly chalky/gritty, with a bit too much cinnamon (maybe a touch of nutmeg?). I think it would play much better with alcohol! Flautas! 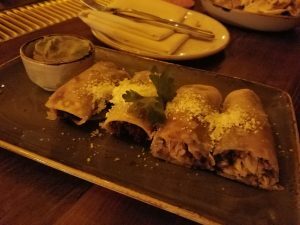 I don’t think I’ve ever had flautas previously. I thought these were OK; the boys seemed to like them a bit. Aguacate salsa on the side brought a lot of discussion… “This is really bad guacamole” (not me) “That’s because it’s not guacamole” (me) haha. 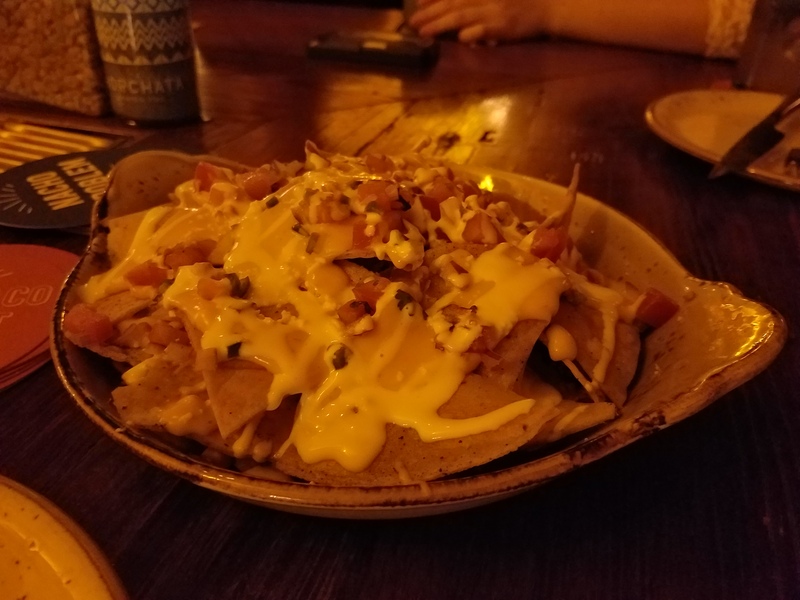 But the nachos – blurry, dark photo notwithstanding – how oh how did they manage to get the chips to stay crisp straight through to the bottom, to the last one (I ate the last of this, so I KNOW IT WAS CRISPY)? There was no shortage of toppings, which I happily nommed away on – Hubba Hubby wasn’t quite as enamored, mostly because of his dislike of tomatoes – but I loved the interplay of slightly spicy cheese (I broke out into a small sweat eventually), the juicy tomatoes, the cheese crumbles — all of it really worked to make me happy. In the end, the boys pushed the plate towards me as I basically finished the whole plate myself. Sorry, boys!! 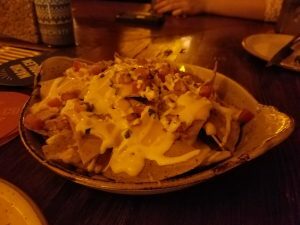 Overall, I really loved the nachos. I could do without the flautas and even my horchata (sadly), but I’d love to go back – for more nachos and perhaps to try some of their other offerings… like tacos. Mmm, taco Tuesday.